Potato dauphinoise is possibly the most luxurious and delicious invention on the planet (according to our chef Mimi). This gratin however, is the slightly healthier version. 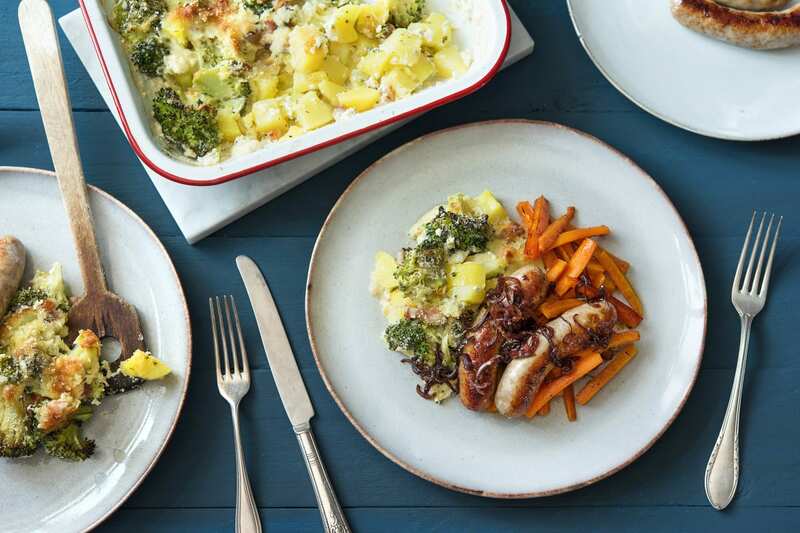 Potatoes and broccoli combined with pancetta and cream, go hand in hand with some delicious sausages from our friends at Roaming Roosters, and with a side of honey glazed carrots, you can’t go wrong! Bring a large pot of water to the boil with a pinch of salt and preheat your oven to 210 degrees. 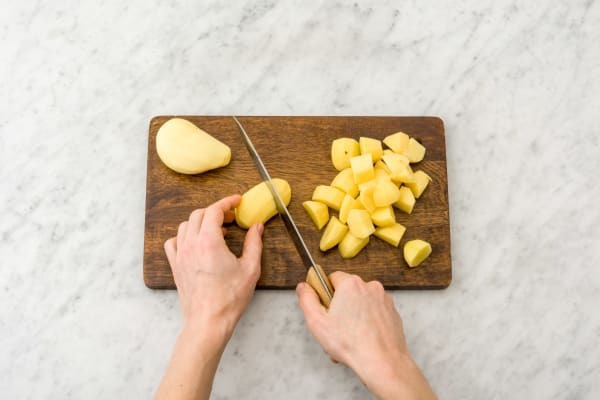 Peel and chop the potato into roughly 2cm pieces and separate the broccoli into florets. Add your potato to the pot of boiling water and cook for 5 mins before adding your broccoli and cooking for a further 5 mins. Drain and leave in a colander for 2 mins. Pull the thyme leaves off their stalks. 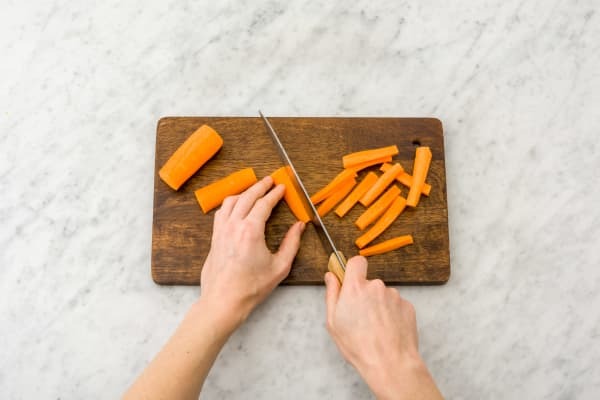 Peel and chop the carrot in half lengthways, then chop into batons about 1cm wide and the length of your index finger. Peel and cut the red onion in half through the root, then slice thinly into half moon shapes. Grate the cheese. Add a splash of oil to a frying pan on medium heat and add the pancetta. Cook for 4 mins or until crispy, then remove the pan from the heat and leave to one side. Pour the cream into a jug, add half your cheese, half your thyme leaves, the mustard, a pinch of salt and a grind of black pepper. Pop your broccoli, potato and pancetta into an ovenproof dish. Tip: Leave the oil from your pancetta in the frying pan if you can. 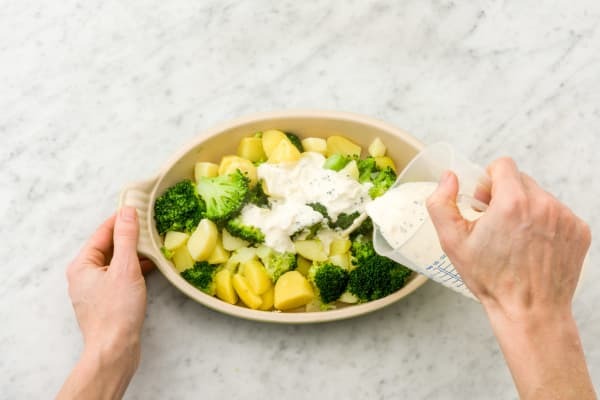 Pour over your cream mixture and top with the breadcrumbs, your remaining cheese and another pinch of salt and pepper. Put the dish in your oven on the top shelf to cook for 25-30 mins or until brown and bubbling. This is your gratin. Pop the sausage on a baking tray and place in your oven for 25 mins. Add your carrot to another baking tray, drizzle with oil, honey, remaining thyme leaves, and a pinch of salt and black pepper. Give the tray a good shake and put in your oven for 25 mins.Tip: If your oven only has two shelves, just move the carrots to the very bottom. 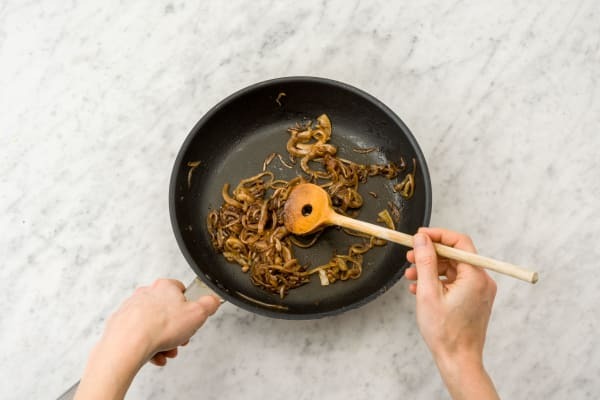 Add a splash of oil to the frying pan you used for your pancetta (no need to wash!). Put on medium heat and add your onion, salt, pepper and a pinch of sugar (if you have some). Cook for 10 mins, stirring occasionally until soft. Add the balsamic vinegar and cook for a further 10 mins on very low heat. When your onion is soft and caramelised, put a lid on the pan and leave to the side. When your gratin is brown and bubbling, your carrots are roasted and your sausage is cooked, remove them all from your oven and serve on plates, with a spoonful of your caramelised onion on top.